This engine started out being modeled after the 4-cylinder Cirrus engine, but I have since learned it more closely resembles the Whittle V8 engine. These pictures are at the current progress level and I will go back and repost earlier pictures if there is an interest. Count me in for the ride Chuck! 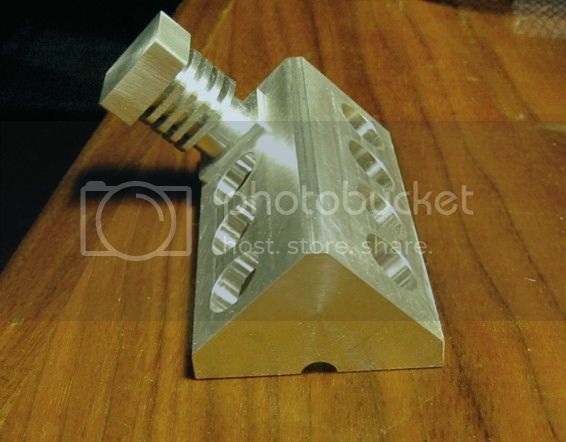 Some more pics of the machining steps would be great! Our first engine post, and from one of the 'greats' as well. Chuck, you are most welcome to post any of your builds on here. I agree 100% with John in all respects - keep it coming! Here's a picture of the raw stock. 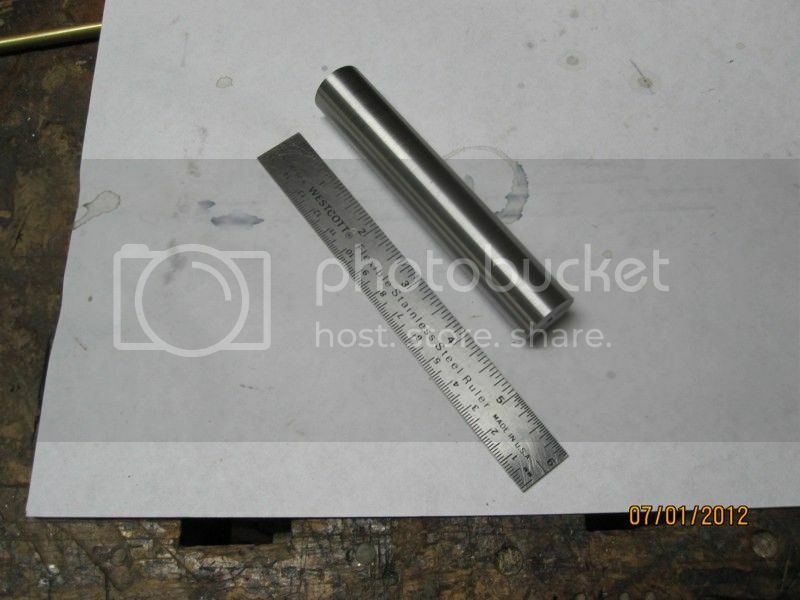 I turned a 1" diameter piece of 12L14 down to 13/16" and drilled center holes in each end. I had to noodle on it a bit to figure out the best way to do it. I decided in the end to turn it between centers. So the first problem was to drill center holes on each end, at 90 degree intervals 1/4" off center. I needed an identical set of holes on each end, and each corresponding pair of holes have to be exactly opposite each other. Luckily, I have a nice tool makers vice that is ground square and flat on all sides, so I was able to clamp the blank in the vice, then use my height gauge to find the center and scribe lines all the way around and a second set at 90 degrees to the first. I also scribed a center line on the face of Jaw #1 on my four jaw chuck. Using the 4-jaw chuck to offset the the work by .25" I drilled the holes, loosening the work and rotating it 90 degrees between holes, lining up the radial line on the end of the blank with the scribed line on the face of the chuck jaw. I think I got them pretty true. I'm designing this engine as I go, so work may be slow at times. Just hope I can see it through to the end. 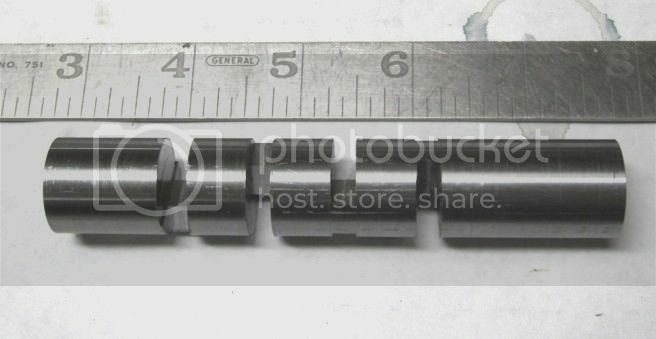 Tomorrow I start turning the connecting rod journals, saving the mains journals until last. 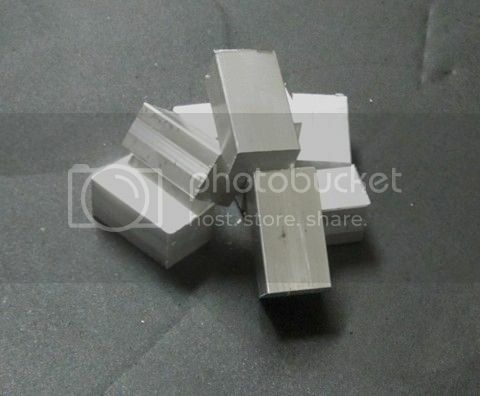 I milled away the bulk of material around the soon to be connecting rod journals. Then I went back to the lathe and turned the journals down to their finish diameter of 7/32". 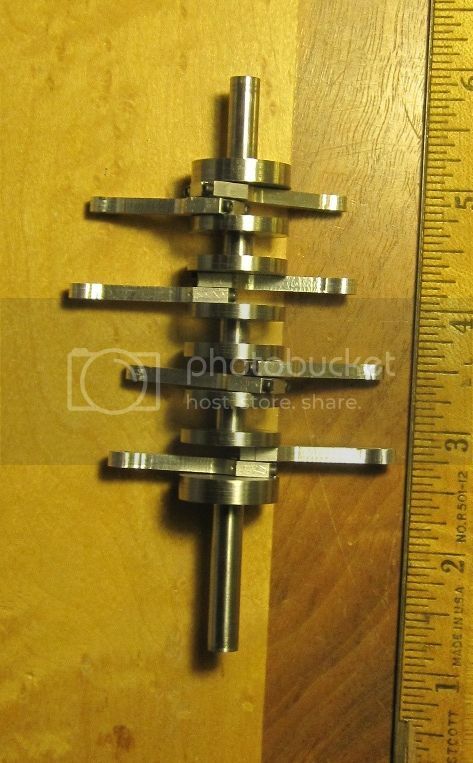 This was done using my 4-jaw chuck, not between centers as originally planned. I still have to widen the gap which I will do next. 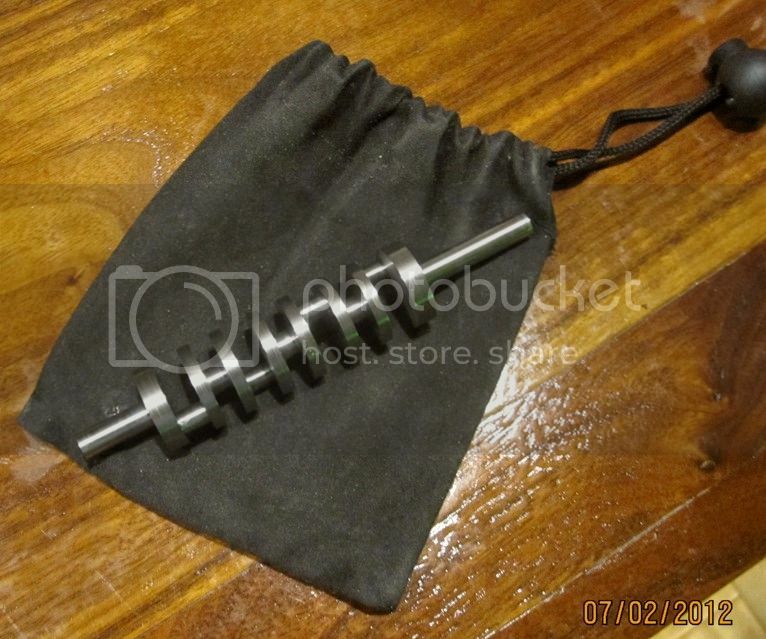 I finished up the crankshaft. Turned out really nice. Of course, it took me all day to make it. Quite a process! 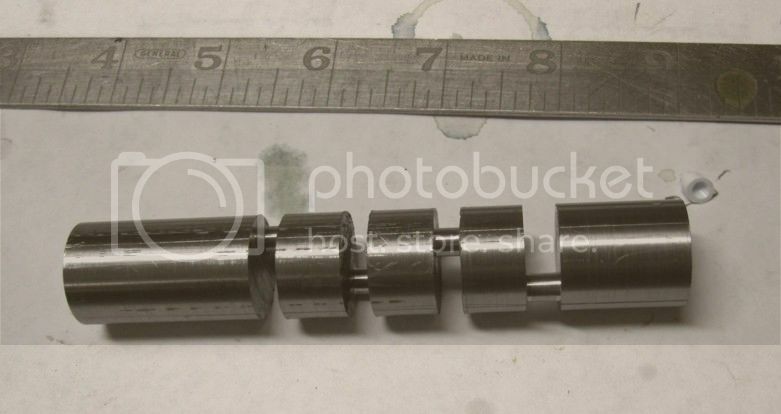 Kind of hard to tell from the photo, but this is a cross-plane crankshaft. That means that the throws are 90 degrees apart as you proceed from one end to the other. Got some more done on the engine today. I started roughing out the top part of the crankcase. 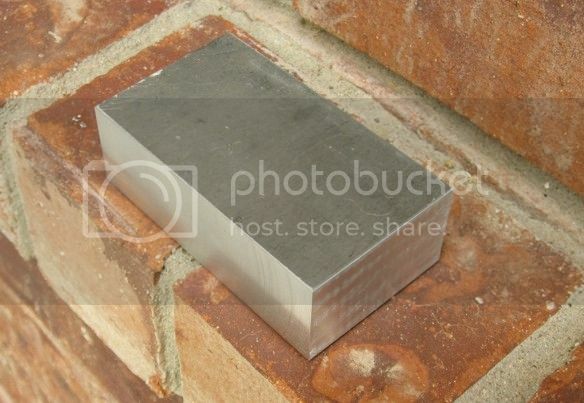 Here is a picture of the block I'm using. 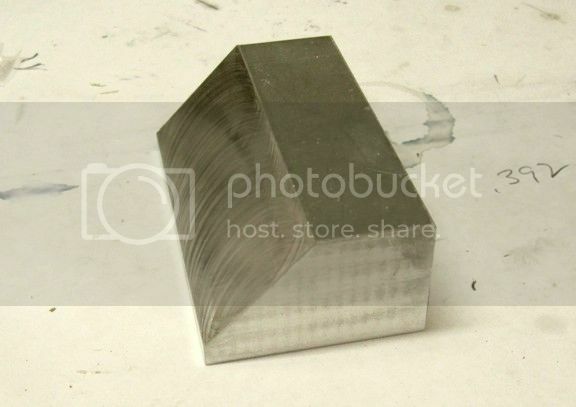 It's magnesium and was cut from a 1" thick piece that I've had laying around for a long time. The overall dimensions of the block is 3" x 1.7" x 1" thick. 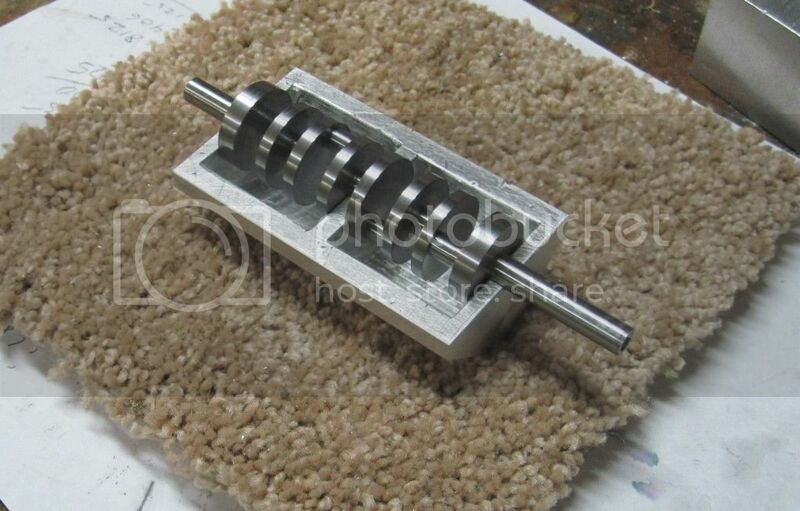 Here is the block mounted in my milling vise read to surface one of the sloping sides. 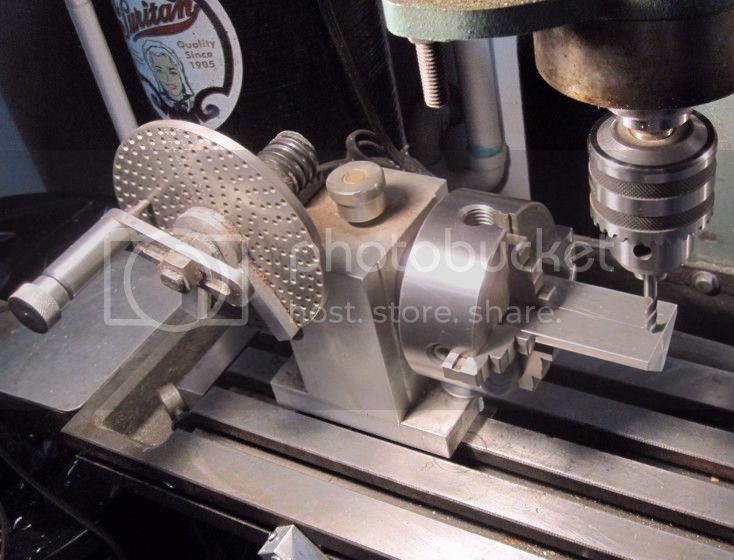 I'm using a 1.25" indexable face mill to form the 45 deg angled faces. This is the block with one of the angled faces finished. This magnesium machines really nicely. I was able to mill away .100" on each pass. 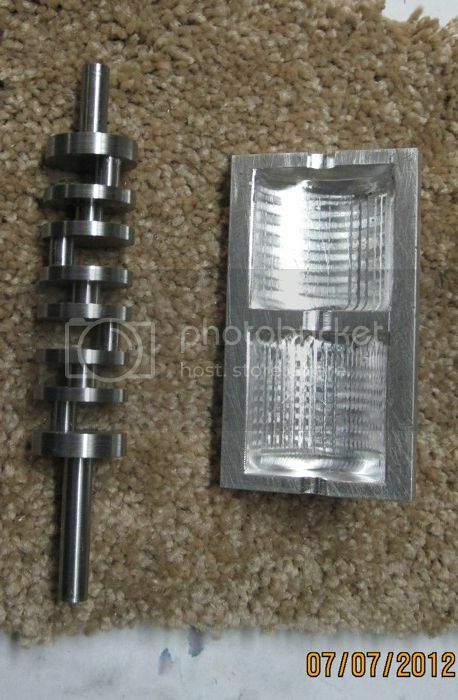 And here is the piece with both angled faces milled, along with crankshaft for size comparison. The next step will likely be to hog out the underneath side of the crankcase. Not entirely sure how I will do that, probably with an end mill. 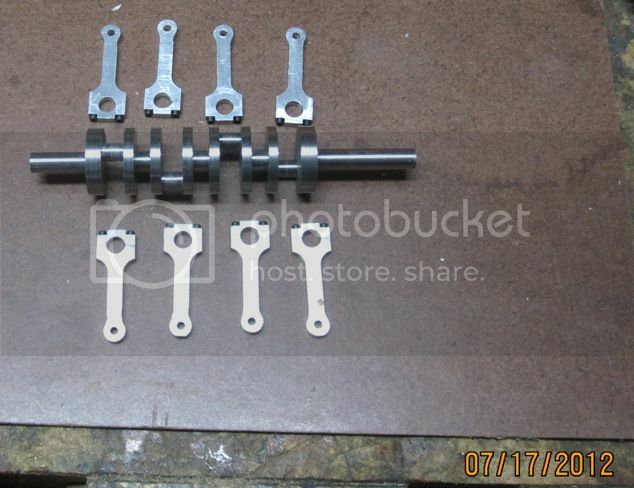 This is iteration #2 of my crankcase, top half. The first one would probably have worked, but I missed a lot of the dimensions, by a lot, so couldn't in good conscience continue with it. 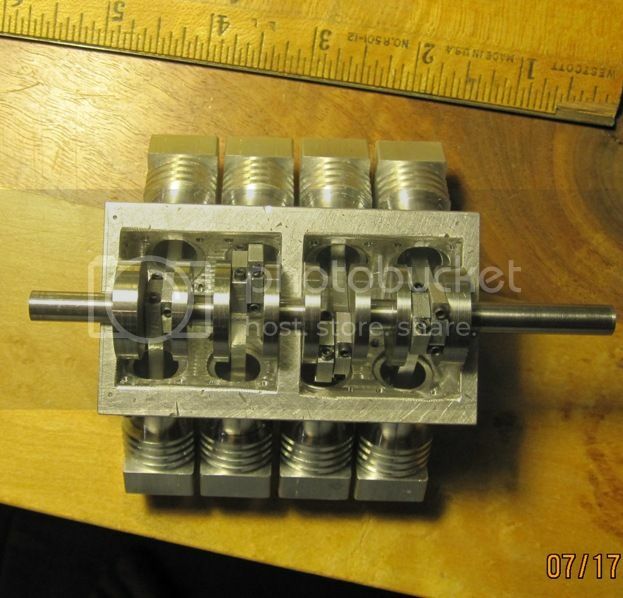 With this iteration, I've mounted the crankcase half in my dividing head. 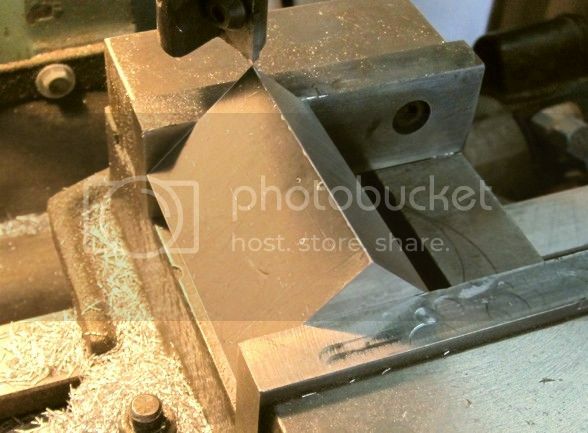 I will use the rotating motion and lower the end mill a bit at a time to achieve a semicircular, concave cutout in the metal. I think this will give me a lot more consistent result. The metal cuts really nicely so I don't think the long overhang will be a problem. I plan to go slow. Could really use a CNC mill at this point, but this will have to do. I may shoot a video of part of the process to show how it works. This is work for tomorrow. 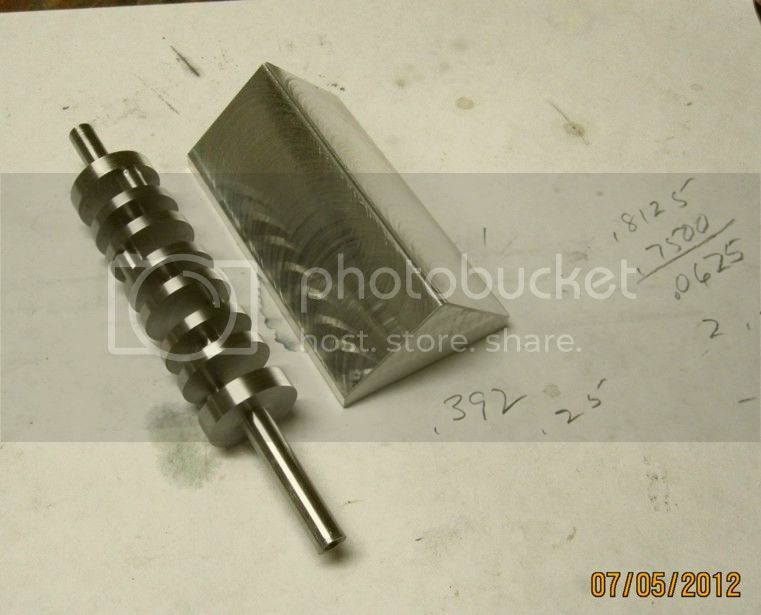 I got the crankcase top, 2nd version pretty well finished today and I'm quite happy with the process and the results. I'll be uploading a video showing how I used my dividing head to position the work for hollowing out the inside. I'm hoping these will have been the most difficult pieces and having them out of the way should make the rest of the project go pretty smoothly (famous last words!). ere's a couple of videos. The first shows how I formed the semicircular cavity in the underneath side of the top crankcase half. The second video shows it finished. And here's the first prototype. 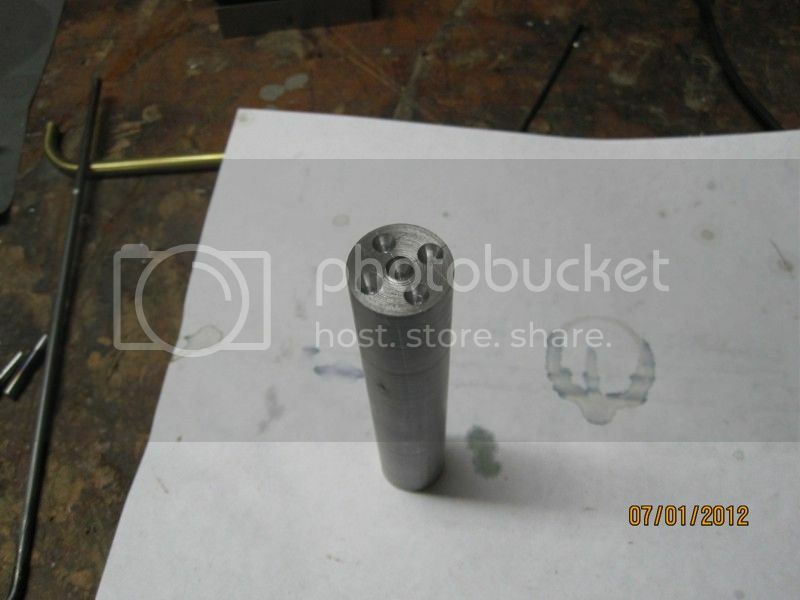 I decided to make the head integral with the cylinder. Simpler and easier to make. Sigh, 7 more to go! i am looking forward to getting back to my fairbanks build but work keeps getting in the way.